YANGON—In a video message, the Arakan Army (AA)’s deputy chief, Brigadier-General Nyo Tun Aung, told ordinary Arakanese on Wednesday that if the current fighting in northern Rakhine State continues to worsen, it could spread to other places in the state. His message followed a number of actions by the Myanmar military that have seen it send more troops to northern Rakhine State. Additionally, National League for Democracy (NLD)-appointed Chief Minister U Nyi Pu recently gave permission to the Army and state police to conduct household checks to squeeze out AA members in seven townships. The video message was made in the Arakanese language by AA deputy chief Nyo Tun Aung at the AA’s headquarters in Laiza, in the Kachin Independence Army (KIA)’s area of control in Kachin State. Brig-Gen. Nyo Tun Aung said that government soldiers and police are forcibly searching suspected homes in the middle of the night without prior warning, referring to an incident that happened on Tuesday in Kyauktaw Township’s Pan Hpe Chaung village. About 40 soldiers and police forcibly raided a home where housewife Daw Tin Shwe was alone while her husband, U Kyaw Win, was traveling to a neighboring village to purchase timber. The village is close to Kan Sauk military battalion.Brig-Gen. Nyo Tun Aung’s message contained a number of safety recommendations for villagers and a list of dos and don’ts while travelling in conflict zones. He issued four warning statements regarding areas in Rakhine State and said the conflict zone was broadening. He also repeatedly urged villagers to implement such practices in the villages as soon as possible and requested the villagers spread his message. He added that in the ongoing battles in Rakhine, the casualties of the Myanmar military (or Tatmadaw) appeared to be high. In January and early February, the government Army lost hundreds of soldiers in battle, the AA vice chief claimed. Brig-Gen. Nyo Tun Aung said that in order to prevent dejection in the ranks, the military never publicly announces the death toll for its soldiers. He said that because the Army had been firmly defeated in the clashes, it was being aggressive toward Arakanese civilians. He warned that the Tatmadaw would continue to commit rights abuses, including torture and arbitrary arrests of Arakanese civilians. He promised villagers that if the authorities badly treat the Arakanese people, they will be made to pay an eye for an eye. The AA expected fierce fighting would continue and that the death toll on both sides would likely rise in the near future. “We will not give up on our ultimate mission, no matter what the circumstances,” he said. Brig-Gen. Nyo Tun Aung told villagers via a live-stream that Tatmadaw soldiers exploit ordinary commuters in the region by offering free rides to their destination. If the troops are ambushed by AA fighters, they denounce the AA as targeting civilians. He suggested the villagers avoid riding in military trucks or private trucks with soldiers. According toBrig-Gen. Nyo Tun Aung, the AA plans to issue more statements to the Arakanese public, keeping community leaders in the villages informed, and issuing warning letters to traitors and so on. He also warned the public to be careful about the authenticity of statements they read, as some fake announcements had been published in the past by supporters of the government Army. “If it reaches beyond your knowledge, please consult with well-educated people or those who have enough knowledge to judge the authenticity [of the statements],” he said. AA leaders have occasionally conducted such online conferences in the past. Both AA chief Tun Myat Naing and deputy chief Nyo Tun Aung have held such conferences with Arakanese scholars and residents of the U.S. in recent months. Since early January, the AA rebels have been staging attacks on the government Army in five townships in northern Rakhine State, as well as in Chin State’s Paletwa. They have clashed with Army troops on more than 100 occasions within 40 days. Aid shipments from international relief agencies to Rakhine State’s Kyauktaw Township and Chin State’s upper Paletwa are being blocked by frontline commanders despite hundreds of displaced villagers being in need. Local relief groups estimate that armed clashes between the government Army and the AA has resulted in more than 6,000 IDPs in Rakhine State. 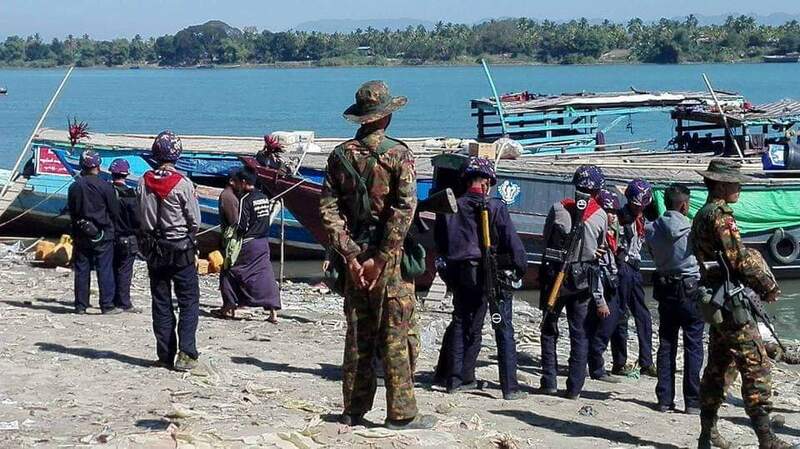 More than 200 Arakanese and ethnic Chin from Paletwa were driven from their homes to neighboring Bangladesh’s Bandarban District last weekend. The Bangladesh authorities summoned Myanmar’s ambassador to discuss the new refugee arrivals in recent days. Correction: A previous version of this article incorrectly stated the AA’s deputy chief Nyo Tun Aung’s ranking as Major-General when, in fact, his ranking is Brigadier-General.